Luke 19:1-10 -- And Jesus entered and passed through Jericho. And, behold, there was a man named Zacchaeus, who was a chief publican, and he was rich. And he sought to see Jesus who He was, and could not for the crowd, because he was of little stature. And he ran before, and climbed up into a sycamore tree to see Him: for He was to pass that way. 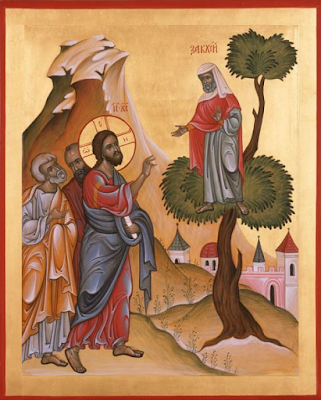 And when Jesus came to the place, He looked up, and saw him, and said unto him, "Zacchaeus, make haste, and come down: for today I must abide at thy house." And he made haste, and came down, and received Him joyfully. And when they saw it, they all murmured, saying, "He has gone to be guest with a man that is a sinner." And Zacchaeus stood, and said unto the Lord; "Behold, Lord, the half of my goods I give to the poor; and if I have taken any thing from any man by false accusation, I restore him fourfold." And Jesus said unto him, "This day is salvation come to this house, forsomuch as he also is a son of Abraham." Let us see how Zacchaeus reaped the benefit of Christ’s entrance into his house. He says, "The half of my goods I give to the poor". Do you see his fervor? He began to disburse without stint, not giving just a little, but all that he had. Even what he held back, he held back so that he could give to those whom he had wronged. From this we learn that there is no benefit at all to a man who gives alms to others of money he has obtained unrighteously and ignores those whom he defrauded in obtaining that money. See what Zacchaeus does with this money: if he defrauded anyone he restores to him fourfold, thus remedying the harm he had done to each man he defrauded. This is true almsgiving. He not only remedies the harm, but he does so with increase. This is in accordance with the law, which commanded that that the thief make fourfold restitution (Ex. 22:1). If we consider well, we see that nothing at all remained of Zacchaeus’ money. Half he gave to the poor, and of the half that remained to him, he gave fourfold to those whom he had wronged. But since the living of the chief publican was derived from fraud and extortion, and since he paid back fourfold all that he had wrongly taken, it follows that he stripped himself of everything he had. From this we see that his thinking goes beyond the prescription of the law, for he had become a disciple of the Gospel, and he loved his neighbor more than himself. And what he promised to do, he did: he did not say, “I shall give half, and I shall restore fourfold,” but instead, Behold, I give and I restore. For he had heard the counsel of Solomon, "Say not, Come back another time, tomorrow I will give" (Prov. 3:28). Christ proclaims to him the good tidings of his salvation. By this house He means Zacchaeus, for the Lord would not call a building without a soul a son of Abraham. It is clear that that the Lord named this living master of the house a son of Abraham, because Zacchaeus was like the patriarch in two respects: he believed and was counted righteous by faith, and with money he was magnanimous and generous to the poor. See that the Lord says that Zacchaeus is now a son of Abraham, and that in his present behavior the Lord sees the likeness to Abraham. The Lord did not say that Zacchaeus had always been a son of Abraham, but that he is now a son of Abraham. Before, when he was a chief publican and and tax collector, he bore no resemblance to that righteous man, and was not his son. To silence those who were complaining that the Lord went to be the guest of a sinful man, He says, "The Son of Man is come to seek and to save that which was lost". This is the explanation of the literal words; but it is easy to understand these things in another sense as well, for moral benefit. Anyone who is chief among many in wickedness is little in spiritual stature, for flesh and spirit are opposites to one another, and for this reason he cannot see Jesus for the crowd. Crowded in by a multitude of passions and worldly affairs, he is not able to see Jesus acting, moving and walking about. Such a man as this cannot recognize Christian acts for what they are—Christ acting and moving in us. But such a man, who never sees Jesus passing by and cannot perceive Christ in Christian acts, will sometimes change from negligence and come to his senses. Then he will climb up to the top of the sycamore-fig, passing by every pleasure and sweetness, as signified by the figs, and counting them as foolish and dead. Becoming higher than he was and making ascents in his heart (Ps. 83:6), he is seen by Jesus and can see Jesus, and the Lord says to him, "Make haste, and come down," which means, “Through repentance you have ascended to a higher life; come down now through humility lest pride and high mindedness make you fall. Make haste, and humble yourself. If you humble yourself, I must abide at your house, for it is necessary that I abide in the house of a humble man. "Upon whom shall I look, if not upon him who is humble and meek, who trembles at My words?" (Is. 66:2) Such a man gives half of his goods to the destitute demons. For our substance is twofold: flesh and spirit. The righteous man imparts all his fleshly substance to the truly poor, the demons who are destitute of everything good. But he does not let go of his spiritual substance, for as the Lord likewise said to the devil concerning Job, "Behold, I give into thine hand all that he has, but touch not his soul" (Job 1:12). And if he has taken any thing from any man by false accusation, he restores it to him fourfold. This suggests that if a man repents and follows a path that is opposite to his former way of wickedness, he heals his former sins through the four virtues (courage, prudence, righteousness, and self-control), and thus receives salvation and is called a son of Abraham. Like Abraham, he also goes out of his land and out of his kinship with his former wickedness and out of the house of his father (Gen. 12:1), meaning, he comes out from his old self and rejects his former condition. He himself was the house of his father, the devil. Therefore, when he went out of the house of his father, that is, when he went out of himself and changed, he found salvation, as did Abraham.